Set in 1908, this tells the story of a little boy who is sent away from his abusive home to live with a group of inventors. He’s enthralled by their attempts to build an airplane but he can’t permanently escape his home, where, as his uncle says, “Your mother needs you”. I don’t understand the physics behind Einstein’s theory, and I don’t believe in the existence of a spirit world, but my introduction to Lodge’s work changed the way I think. I don’t know, and I don’t believe there is sufficient evidence yet to prove, whether the ether is real the way the atmosphere is real, or the way the equator is real. Whether Einstein’s theory has been proven, or Lodge’s theory of survival of the personality after death, or neither, or both. I don’t know whether my father exists in some ethereal form or only in my heart. What I do know is that the questions we ask about the world and the experiments we design to answer them are connected to our feelings. A woman goes to study with a naturalist who has an open, academic feud with Darwin. The student starts to examine her own assumptions, read Darwin’s work, and realize that the naturalist was wrong, even as she has to acknowledge that he is a great naturalist. Nothing “happens” in this story and yet everyone changes enormously. It has some of the most beautiful language in the book as the natural world is described. This story is set in 1873. This is a cautionary tale about assumptions. Set in 1939, it opens on the deck of a ship that has just rescued shipwrecked survivors (the first false assumption is that it is safe to be on a boat on the eve of WWII). The lead character is fond of coming up with ideas and publishing them before they have been properly tested. Over and over again, in his story and in the stories of other scientists that are mentioned, we are reminded that hypothesis without proof is meaningless. A the same time, the main character makes assumptions about the relationships in his life without proof, and ultimately those relationships are challenged. The first story in this collection is about a little boy who dreams of being saved by science, but isn’t, not because the science doesn’t work but because the scientists fail to protect him. The next stories deal with what happens when a current scientific theory is proven wrong and replaced with a new one. In Archangel, the little boy from the first story is a soldier in Russia with a mysterious wound. Once again he turns to science, in the form of X-rays, to help him, and once again the technology works but the human will does not. This story is set in 1919. 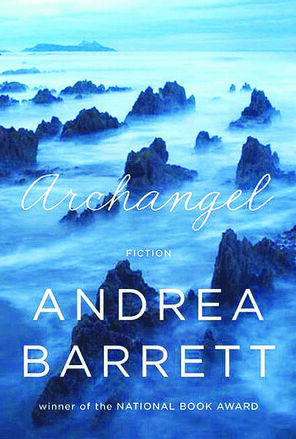 This entry was posted in Book Reviews and tagged Andrea Barrett, Archangel, fiction about science, historical fiction, literary fiction.